With the amount of traveling I do, I connect a lot through O'Hare in Chicago. Usually the offerings are quite boring. 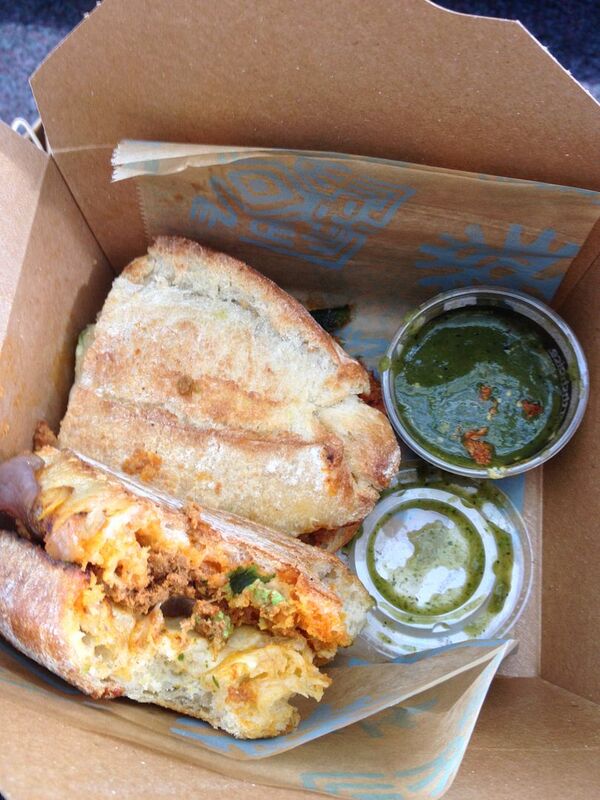 But, when I flew through O'Hare this week, I was greeted with a new offering from Rick Bayless, Torta Frontera. The new restaurant in in Terminal B, right by B12 to be exact. On their menu, they offer homemade tortas (basically a Mexican style sandwich) and salads. Everything is made to order right in front of you. No heat lamps here. They also have craft beer on tap. Finally, all of their ingredients are sourced locally, a plus in my eyes. I ordered the Chorizo Torta. Perfectly cooked chorizo sausage on a fresh torta roll. The roll is stacked with black olive spread, pickled red onions, sautéed green chili, and finally covered with Chihuahua cheese. The sandwich is toasted until the roll is crispy and the cheese melts. The sandwich is served with a side of chile verde, my new Mexican favorite, for dipping. This sandwich was one of the best I have ever had. Spicy sausage, salty olives and cheese, all brought together with the onions and peppers. The chile verde made it even better. To top everything off, they put your sandwich in a nice, small shopping bag with handles. This allows you to walk the terminal with your rollaboard, carry on, torta, and a drink without dropping anything. It is the small details that count. Since everything is made to order, it takes about 10-15 minutes to get your order. But, it is worth every minute. Next time you are in O'Hare, give Torta Frontera a try. I would even walk over from the C gates. Overall grade, A+. I really like everything associated with Bayless. His shows and books. Someday I would like to go to his restaurants in Chicago. He had a similar restaurant downstairs at Macy's in San Francisco. I never made it and it got mediocre reviews. I am glad you had a great meal at the airport. Rick Bayless was the original Mexican cook in my humble opinion. His book Mexico - One Plate at a Time is outstanding. He was Bobby Flay before Bobby Flay. Classy, humble, understated. I respect him as well.